Check out the video to see how amazing these are! 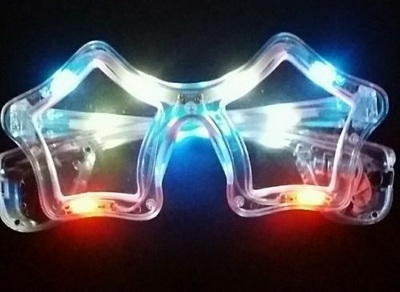 Light Up "Star-Shaped Frame" Glasses! SUPER BRIGHT and BRILLIANT! 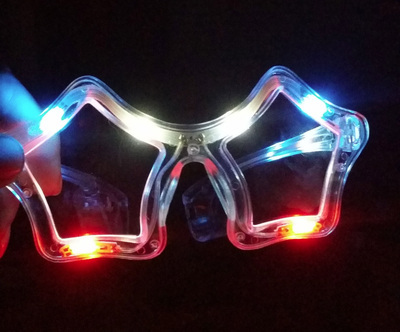 A whopping TEN Red, White, and Blue LED Lights in each pair! cool even in daylight - AWESOME at night! THREE seperate flashing functions! Fast blink, Slow blink, and all on! Change with a push of a button! Button cell batteries included and installed! PLUS an EXTRA set of batteries FREE for future use! a $5 value FREE!...that's almost like getting the glasses for a BUCK! Ready to DAZZLE out of the package! and with extra batteries FREE, you've got almost nothing to lose! Great for ANY Patriotic event or parade! GREAT for parties, clubs, raves, ANY EVENT! 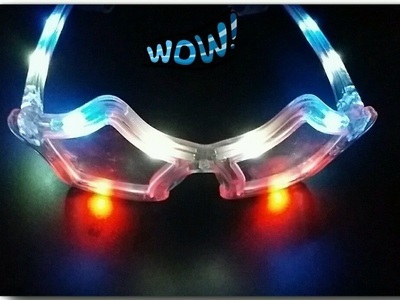 If you LOVE light up novelties, toys, and rave stuff as much as WE do, then you'll be as surprised as we were when we checked out these LIGHT UP STAR Glasses!...We check out and TEST every light up gadget that comes out of China, (and to be completely honest with you, a LOT of what is made is junk.) But when we find a piece that really is cool or unique, we buy it! My son and I REALLY LOVE this stuff! We get EXCITED when something new comes out, so if we offer it for sale, we REALLY have checked it out, played with it, tested it for quality, worn it out in public etc etc...When we first saw these Star-shaped Glasses, we had our doubts. At first glance, they looked a little silly. (And to be honest - - they ARE - lol!)... But when we bought a sample and powered it up >>WOW! were WE SURPRISED! Nothing "silly" anymore. These glasses are BRIGHT!! Even in DAYLIGHTl! (most light-up stuff looks completely washed out in daylight, but THESE still show up nicely) But turn the lights out, and WOW! ** they were ELECTRIC!! They really LIT up the room! - AND best of all - we could still SEE out of them (unlike the shutter glasses which obstruct your vision) What's the point of wearing glasses that light up and flash, if you can't see where you're going in them? ..We were able to get a decent price on them but we could ONLY get them with red, white, and blue led's in them - (TEN led's to be exact) - so ya, these are a MUST for the 4th of July (or parades, political rallys, etc)...BUT guys, they look SO GOOD, you can were them ANYTIME! They are great for DJ's, KJ's, and BANDS too! Talent contests, Karaoke shows, birthday parties, Music Festivals, Burning Man, Electric Runs, ANY time you want to be a STAR! (or just look like one!) $6 plus shipping AND we give you an EXTRA set of BATTERIES! Get your Flashing STAR Glasses today, and be a STAR tonight!! !..ALL are CHECKED out and TESTED before we ship! Frames and lenses are CLEAR. Lights are Red, White, and Blue and are embedded in the frame along with the wiring. Very SAFE! Look at the photos! They are REAL. I took 'em myself. We WANT you to like 'em when they arrive so please look at the photos so you know what they look like before you buy. We don't want surprises any more than you do. We make a very small profit on this stuff so we can't return things that folks get but don't like. That's why I take REAL photos so you'll know what you are getting. At least as close as a photo will show you. We think they are wild, cool, and fun! They probably aren't for everyone but they just might be for YOU! If you're a DJ or a KJ (Karaoke Host) these are a GREAT PROP! and an even greater Prize Giveaway for the best singer of the night! Buy 6 or more, I'll give you a better price! Thanks for looking! !